Bilbo and the dwarves are drawing closer to the Lonely Mountain. Thorin’s dislike for all things elf has not softened following his meeting with Elrond, so when the company delve deep into Mirkwood, the kingdom of the wood elf’s, his intransient mood when he meets with Thranduil loses him a powerful ally. Bilbo continues to hide the One Ring; using it to get the company out of tricky situations, but how much help will it be when he comes face to face with Smaug...? 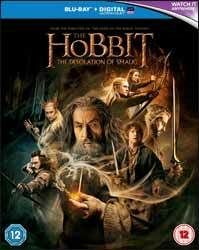 The Hobbit: The Desolation of Smaug (2013 - 2 hr, 41 min, 16 sec - 2D Blu-ray) is the second Peter Jackson film based on Tolkien’s, The Hobbit: There and Back Again (1937). Jackson's adaption of the book continues to cause controversy, this time with the introduction of Legolas. Although not in the main text of the book, he is the son of Thranduil, so it makes sense that he would appear, even if it ruins the continuity of The Lord of the Rings when he is shown Gimli’s portrait, but fails later to mention that he had met his father. Still, it’s nice to see Orlando Bloom back. However, the introduction of Tauriel, female elf warrior, besotted with Legolas, but, not adverse to a bit of dwarf loving, was not even in the original novel. Personally I don’t really have a problem with this. As a great fan of the books, I realise that films and books have very different reasons for being and different functions to fulfil. Tolkien used very few women, which is a problem for modern audience used to seeing women displaying strong characters. Plus, Evangeline Lilly, as Tauriel, is mesmerising in the role. In the end the introduction takes nothing away from the source but adds a much needed additional level to the film. If the first film looked great but trudged alone at a snail’s pace, the second is pretty none stop action. There is a lot to get through; the introduction of the Necromancer into the main body starts the trip which will lead to The Lord of the Rings and the first faceoff between Sauron and Gandalf. The company, meanwhile have a lot to get through: There’s the spiders in Mirkwood, escaping the Wood Elf’s kingdom, getting through Laketown, before they finally make it to the long awaited confrontation with Smaug. The film has taken a much darker turn. We can see Throin’s (Richard Armitage) increasing obsession with the riches beneath the mountain and the growing madness which claimed his grandfather, even some of the other dwarves are growing concerned as Thorin starts to cast friends away and views Bilbo as expendable, not even remembering his name. Bilbo (Martin Freeman) is growing in bravery, partly because of the ring, but only partly. One of the great themes of both the book and the film deals with change and heroism, while some fall from grace, Bilbo is becoming greater than the Hobbit which preferred the comfort of his home and pipe. A few new faces make an appearance. Mikael Persbrandt turns up as the shape shifting Beorn and if Jackson follows the book, we will be seeing him again. Laketown brings us two new major characters in the form of Bard (Luke Evans) and the Master of Laketown (Stephen Fry), each bringing their own particular skills to enrich the film. Last, but certainly not least, we finally get to see Smaug (Benedict Cumberbatch), was it worth the wait. The design is certainly striking and the combination of the CGI and Benedict Cumberbatch’s voice give Smaug the aura of an evil intelligence. The main bulk of the extras are split into two sections. The first (40 min, 36 sec) consists of four small films, which can be viewed together or separately which takes a peek behind the curtain of the film's making. The second (36 min, 41 sec) consists of four pieces which look at both the music and the pickup filming. One of the great things about Jackson extras is the feeling of inclusion. These show the cast and crew going about their work, of course you get some insights into what is happening, with lots of behind the scenes footage, but you never feel that these are just being used to either flog or big up the film. The film is presented with a stunning picture, with a 1.78:1 aspect ratio. Audio is DTS-HD Master Audio 7.1 for the English tracks and DTS 5.1 for the English, descriptive narration, French, Italian and Chinese tracks, and the same languages appear as subtitles with the addition of Dutch. Although it will have its detractors, the film is a masterful piece of work, lighter than The Lord of the Rings, which befits its source material; the second film is one elongated thrill ride.